Now it's time to meet! If you got Lacey, The Back to Bad Series by Jade Eby, you're in for a thrill ride along side a badass female bank robber! Lacey Caldez is in a bind. Her bills aren't paid, her mother is broken, and they're about to lose their house. Realizing she's low on options, she buries her pride and approaches the last person she ever wanted to owe a favor to. Robbie Reynolds is brutal, demanding, and one hell of a mobster. He's also her ex. But despite his character flaws, he offers her a chance to avoid financial ruin—but can she stomach what he's asking of her? If you got Pieces of a Lie by Rowena Holloway, you're in for a psychological thriller set in Austrailia! Crime runs in her family... or does it? Mina Everton’s search for her criminal father draws her into the sinister underbelly of the suburbs. The closer she gets to her father, the more she’s pulled into the dangerous world of Slab Carlson. When a series of home invasions end in the brutal murder of a pensioner, disgraced Detective Lincoln Drummond is determined to solve the case and redeem himself. But when his investigation leads him to Mina Everton, the daughter of an embezzler, Drummond faces his toughest case yet. Because Mina gets to him in ways no prime suspect ever should. When a second murder occurs, Linc must decide what he values most and Mina must choose between destroying herself or Detective Lincoln Drummond, the only man who believes in her. Buy Pieces of a Lie now! 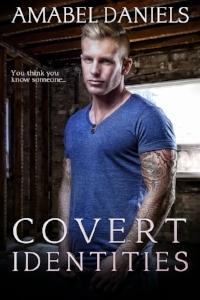 If you got Covert Identities by Amabel Daniels, you're in for a small-town contemporary romantic suspense full of mystery! On the heels of a nasty divorce, celebrity dancer Amy Perry expects a mess when she returns to the summerhouse her Uncle Henri willed her. But she didn’t count on the headache of one too-hot-to-handle contractor—who also happens to be her childhood nemesis. Despite the shock of learning who his new employer is, Sean Newland wants to treat this renovation like all his other projects: with professionalism and ease. In Amy’s presence, it’s not so simple. Because on the first day, they find a dead body. Later, they stumble upon a journal packed with unusual hints of past sins. Working together, both on the house and unraveling the book’s riddles, they discover new truths about one another. In the game of love, loyalty, and trust, it appears that many around them aren’t who they seem to be—and uncovering true identities can come at a very high price. If you got Shatter by Katlyn Derouen, you're in for an emotional and dark romantic suspense in a small-town! Grief was a word that was nothing but familiar to Katherine. After losing her brother and best friend in an uneventful movie shooting, two years later, she still has yet to overcome the pain and suffering it has brought. Getting her first job at nineteen proves to be a "way of coping", as said her counselor. It is there that she meets Xavier, a boy who seems to have struggles of his own. Sweeping Katherine off of her feet proves to be no hard triumph, but eventually a darker side of Xavier is revealed, and gone is the boy she once knew, instead replaced by someone so unrecognizable it is hard to believe it's the same person. Katherine soon finds herself trapped in this abusive relationship with the person she cared for the most, but what she fails to realize is that the person you love the most can be the one who destroys you. Losing herself in the passion, Katherine denies anything being wrong with the relationship, but how long can she pretend, until something terrible happens that can no longer be fixed? If you got Dangerous Contracts by Julie Strier, you're in for a fast-paced, action-packed thriller in the city! A deadly TV show. An agent who no longer wants to kill. Will he get out of his contract alive? Mega-corporation Create or Dies’s reality TV show promises contestants fame, fortune, and a record contract. There’s just one catch — if they lose, they die. The show’s top agent, Thomas Butcher, is consumed with guilt over the families that he has destroyed. He no longer wants to kill now that he’s started a family of his own, but the only way out of his contract is death. When he’s sent to kill a contestant who looks exactly like his son, he fails to complete the job. Now on the run from CoD, he’s haunted by the notion that this boy may be his child and he goes on a mission to learn the truth. Will he find the answers he’s seeking without destroying his family or losing his life? If you got The Cleaner by Kiersten Modglin, you're in for a dark, angsty second chance romantic suspense! Eight years ago, Gunner left his hometown and vowed to never look back. When his past collides with his present in the form of a familiar face, Gunner must return home to take care of one final mess...the woman he left behind. 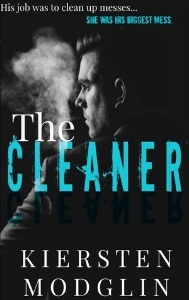 Their secrets can save or destroy them...but only the truth will allow them to be cleaned. If you got Red on the Run by K.M. Hodge, you're in for a dark and gritty crime thriller in a big city! Buy Red on the Run now! If you got Human Nature by Rachel Renee, you're in for an unconventional crime spree that will keep you guessing until the end! Human Nature- Acquired by nature-including, thoughts, feelings and actions. After solving a challenging case, one that thoroughly questioned her instincts, it’s not long before Detective Eliza Sheppard and her team are pulled back into the streets. Another murder, this time taking place in the Historic District of Savannah. The evidence is collected, the suspects are questioned, but still, something is not adding up. When the results of the autopsy are revealed, Eliza recognizes that she’s dealing with something unlike anything the Savannah PD has ever experienced. The streets of Savannah are filled with thousands of possible suspects, roaming free, living in society among the rest of humanity. Eliza and her team of detectives are on the hunt for someone and they’ve got a lead on a person whose basic human nature is in question. If you got The Girls Across the Bay by Emerald O'Brien, you're in for an unpredictable and suspenseful mystery with an unlikely duo! As adults, they are reunited in the small coastal town they dreamed of living in as children, but the reality of life in Tall Pines is far from what they had imagined. When a woman is found dea in her home, Madigan reports on the crime while Grace investigates. A dark connection to the victim is discovered, pulling them both closer to the crime and the traumatic past they are desperate to move on from. With old wounds ripped open and dark secrets threatening their bond, the sisters must rely on each other more than ever before to survive. Buy The Girls Across the Bay now! If you got Running in Circles by Laurèn Lee, you're in for a dark psychological suspense read with a wild twist! Ladies Beware… There’s a serial killer out there! Stone City is a quiet town in rural Illinois with a crime rate of practically zero, that is until, a serial killer materializes and begins to wreak havoc by murdering the town’s beautiful, brunette women. After he strikes, all that’s left is a long line of bodies with toe tags and heartbroken families. As the fatalities add up, citizens of Stone City panic and pressure the local authorities to put the culprit behind bars. Sheriff Earl Davis and his loyal lieutenant, Ricky Jensen, will stop at nothing to catch the killer, even if it means sacrificing everything to save their town. Buy Running In Circles now! If you got Primogenito by Greta Cribbs, you're in for a dark, emotional thriller with a supernatural element!